When you were 2 years old, what did you dream about? Mike Haggar dreamed about racing cars and today, he is living that dream. From as far back as he can remember Mike Haggar wanted to race cars. When he turned 12, his dad said that if he helped pay for it, they could get a kart. Mike didn’t waste any time finding ways to earn the money. He started mowing lawns and raking leaves for his neighbors to raise money for his first motorized racing machine. He started racing karts at 14, and was a top 50 in the US by the age of 19. Now, at age 24, he continues that dream and has his NASCAR license, just like Dale Jr., Kyle, Kurt and Jimmie. On weekends at Elko Speedway in Minnesota, Mike and his dad race in the Big 8 Series reaching amazing speeds of over 110 mph on the tiny 3/8 mile, high banked track. Who wouldn’t want to drive Mike’s car. It tops out around 180 mph and has a Chevy 358 modified engine that puts out a screaming 500 horses. The Big 8’s are a custom racing frame composed of sheet metal, plastic and fiberglass to keep the weight down. The engine and suspension have major enhancements. In his 4th year of racing NASCAR, Mike is a top 5 driver at Elko. With the new car, they are continually tweaking the car to get more out of it. He is still looking for his first checkered flag this season, but has finished as high as 2nd and 3rd place in many races. 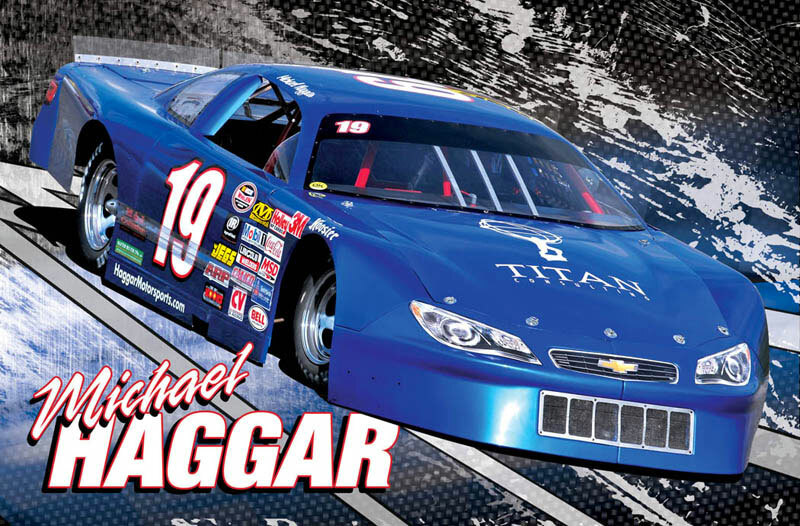 Titan Consulting is a proud sponsor of Haggar Motorsports and wishes Mike and his dad success in this year’s final races at Elko and LaCrosse, WI.